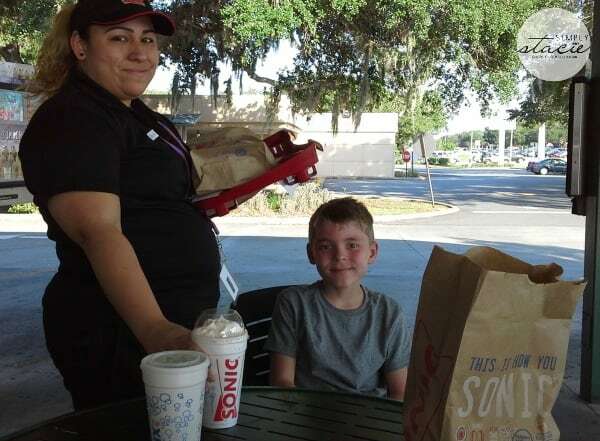 My family enjoys visiting our local Sonic Drive-In and it is always one of our favorite fast food places to visit while on vacation since we know that the prices and food is always great. 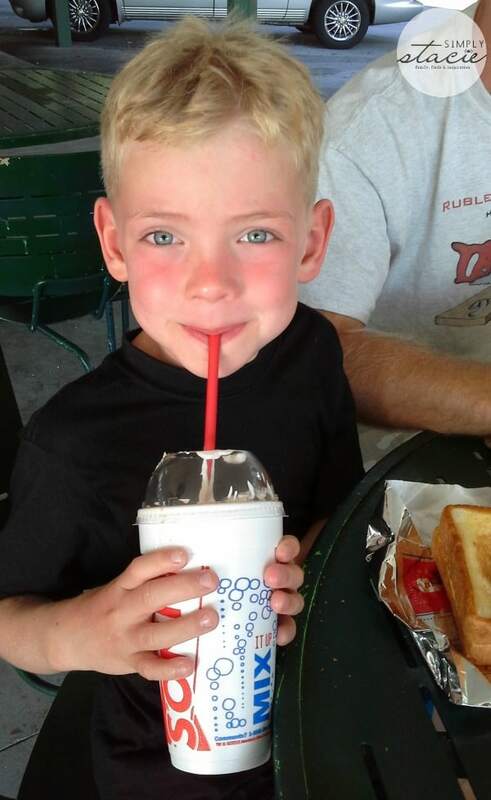 We recently took a two day mini-vacation to a local water park and couldn’t wait to cool off from the hot sun with a delicious shake from the SONIC Drive-In in St. Cloud, Florida. This summer SONIC Drive-In locations have 25 great shake flavors to choose from including three creative new offerings i.e. Jalapeno Chocolate, OREO Peanut Butter and Salted Caramel. When I suggested enjoying a shake after a long day on the water slides, my husband and children were very excited. The only problem we faced was choosing from all of the delicious options but quickly solved that problem by selecting several different shakes to share. I normally pick the Pineapple Shake but this time decided to try one of the newest flavors, the Sonic Drive-In Salted Caramel Shake. It was the perfect blend of real ice cream mixed with sweet caramel and just a hint of sea salt, topped with whipped topping and a cherry. This shake is decadent and packed with flavor, so delicious! My husband really liked the Peanut Butter & Jelly Shake which had an authentic, creamy peanut butter and sweet strawberry jam flavors. My kids raved over their shakes including the Coconut Cream Pie Shake (yum), the OREO Peanut Butter Shake and the classic Chocolate Shake. 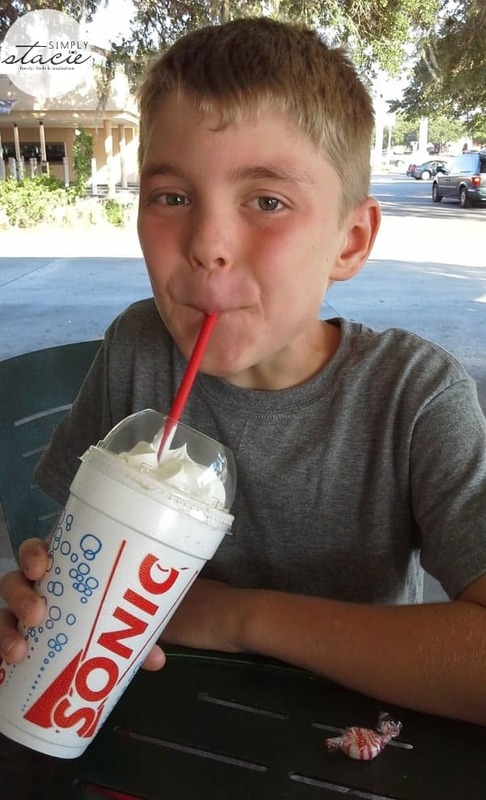 We have all decided that the next time we visit a SONIC Drive-In this summer, we are going to try the adventurous Chocolate Covered Jalapeno Shake too. I am always impressed that even though SONIC Drive-In is a fast food restaurant, the quality and taste of our food is always exceptional and a fun experience for us and our kids. Throughout this Summer of Shakes, SONIC has a great deal for families like mine who are on a budget and are looking to save with half price shakes available after 8 p.m. all summer long. This is such a great deal and makes it an affordable treat for the entire family to enjoy! Which shake do you look forward to trying the most this summer? I am going to try the Strawberry Cheesecake Shake. I am sure that I will be trying more than one flavor. How do I pick? I think I’d start with the Strawberry Cheesecake! I want to try the Oreo Cheesecake shake! The Oreo peanut butter shake is the one I want to try. The pineapple shake sounds so good love to try them all! The Strawberry Cheesecake sounds good! Coconut creme pie shake sounds delish! The Chocolate Cheesecake would be terrific!! Mmmm a peanut butter shake sounds delicious! I would love to try the OREO Peanut Butter Shake. I am going to try the Salted Caramel Shake. i would really love to try the chocolate cheesecake. I want the peanut butter shake! The Oreo peanut butter one sounds AMAZING! I would love to give this to my dad for father’s day! Love Sonic, their burgers are the best, and slushies, so refreshing !!! Thanks for the opportunity to win !!! OMgoodness, the cheesecake shake for me! The peanut butter shake…and I may get one tomorrow now. Thanks for the giveaway… would love a Chocolate-Covered Banana Shake ! I can’t wait to try the Turtle Pecan Master Blast. I’ll have the coconut cream pie shake, please! I’ve actually been planning to stop by Sonic soon because I’ve heard such good things about their peanut butter & chocolate shake. Can’t wait! I’d like the Peanut Butter Fudge shake! the Turtle Pecan Master Blast.